Reference number for this case: 27-sep-54-Foussignargues. Thank you for including this reference number in any correspondence with me regarding this case. To the testimonies of many people who, a little everywhere in France, stated to have seen flying saucers, we must add that of two inhabitants of the hamlet of Revety, community of Foussignargues, at 2 km from Bessèges. Mr. Louis Roche, road mender in Bessèges, 62 years old, lives with his wife in a country house located on a sunny hill planted with chestnuts, withint 200 meters of the secondary road 51 which leads from Bessèges to Saint-Ambroix. It is very close to their residence, in a meadow pertaining to Mr. Camille Soustelle, of Bessèges, that they saw the mysterious machine. In the night of Sunday to Monday, at 02:40, Mrs. Fernande Roche, unable to sleep, stood up and went on the terrace that skirts the frontage of the house. Suddenly, she believed being victim of an hallucination: she saw, indeed, very distinctly at a hundred meters from her place, in direction of the road "a round thing like a red tomato with five or six stems placed vertically, large as half of his wrist." "I several times put my hand on the eyes, adds Mrs. Roche. I did not dare to call, but I awoke my husband while telling him "Stand up, I believe that I see a flying saucer". Mr. Roche also saw the red light. He is affirmative on this point. To him, the object had the shape of a bouquet. At the end of a score of minutes of observation and because of the cold, the couple returned inside the house. Half an hour later, Mr. Roche rose again and noted that "it was still there". He lay down then and all had disappeared in the early morning. We reported very exactly the testimony of Mr. and Mrs. Roche. Perhaps one will be astonished that it is all so late, but in fact, the explanation is simple: the two husbands feared the mocking remark and that is what they told us flatly. on all my body, electric ticklings, my sight gets blurry and... I experience the most awful fright of my life." Thirty or forty seconds passed, then the machine rose slowly, rotated and disappeared at full speed without noise, neither flame, nor smoke. The account by Goujon was confirmed not only by his comrade Pichet, but also by many cyclists who were on the road and who observed the extraordinary craft too. We reported in our Friday issue under which conditions M. Louis Roche, road mender domiciled in Revêty, had seen, as well as his wife, a mysterious luminous craft posed in a meadow near his country house. Many testimonies came to corroborate these assertions. In the same night of Sunday to Monday, a bus returning from Vals-les-Bains passed in Foussignargues around 02:30 in the morning and continued its travel in the direction of Gagnières. At the crossroads, a passenger stopped, Mrs. Julien and one [illegible: of her sons]. These two people regained Besseges by foot. At this point in time Mrs. Julien pointed out to her son a sort of rocket going downward, of yellow and red color with a white circle in the bottom. During this time, the travelers in the bus which hasted towards Gagnières saw, at the same hour, a red light in the sky. These various statements correspond to those of Mr. and Mrs. Roche. We made a point of reporting this back with objectivity. A written question to the Minister for the Air in connection with the "flying saucers"
In a written question, Mr. Jean Nocher, deputy of the Loire, shared with the Secretary of State to the Air the emotion caused in the public by the many and various testimonies concerning the "flying saucers." He asks him "whether his predecessors at the Secretariat of State to the Air had been concerned, as in the United States and in the U.S.S.R. since long years, to open an investigation on the presence of unidentified flying objects in our atmosphere. "If yes, he asks him the publishable results of these investigations, if not, he asks him to constitute a largely wide commission with all the interested scientific branches in order to study this phenomenon objectively by separating the truth from the mistales and the possible hoaxes." Jimmy Guieu indicates that on September 27, 1954 in France at 2:30 a.m. a bus returning from Vals-les-Bains dropped in Foussignargues a female traveller and her son, who went home by foot in Bessèges. They suddenly saw a "kind of rocket going down of yellow and red color on a white circular bottom." All the travellers of the bus which was already a few hundreds of meters further also saw the craft which seemed to operate to land. 10 minutes later at 02:40 a.m. Mr. Louis Roche, roadmender in Bessèges, living in a country house located at 200 of the Departemental Road 51 going to Saint-Ambroix, was awaked by an exclamation of his spouse. She could not sleep and had gone out on the terrace that border the front of the house, and suddenly thought she was hallucinating as she clearly saw at 100 meters from the house in the direction of the road "a round thing like a red tomato with 5 or 6 vertical rods of quite a width on the top of it." "I passed my hand on the eyes several times. I did not dare not call but I woke my husband up." Mr Roche had to admit the obvious: a red luminous object that vaguely had the shape of a "bouquet turned upside down" was posed on the ground. After 20 minutes of observation and because of the cold, they went back inside. Half an hour later Mr. Roche stood up again and noted that the "thing" was still there. He went back to bed and in the morning he saw that all had disappeared. Aimé Michel reports that on September 27, 1954, in Foussignargues in the department of the Gard, at about 02:30 A.M., the bus which circulated on National Road 130 deposits Mrs. André and her son Julien, who were returning from Vals-les-Bains. Mrs. Julien and her son then walk along the country road 51 in the direction of Bessèges, within one kilometer from there, where their residence is located. At this time, they see a luminous object of reddish color in the sky, which is surrounded by a paler halation. The luminous object goes down on the side of the East while slowing down and in the end it is hidden by a hill. During this time, their bus had taken his drive again on national road 130 to reach Gagnières, and was at a few hundred meters in the North of Mrs. André and her son. All the travelers in the bus also saw the odd red gleam going down towards the ground. Aimé Michel also reports that on the same day of September 27, 1954, Mrs Roche, residing at the Revêty locality in the hills that is crossed by the country road 51 in Gard, was outside on her terrace at 02:40 of the morning to take come fresh air. When she went out on the terrace, her attention was immediately attracted to a red gleam diffused by a round and luminous object apparently landed on the ground, at a hundred meter below her, on the side of the road. "The object made me think of a kind of luminous tomato. Five or six small vertical stems, of a perceptible thickness, left its center at its above part." Mrs. Roche could not believe what she saw and observed the thing during a moment, and nothing happened, then went inside to wake up her husband Louis Roche, road mender in Bessèges. Mr. Roche came on the terrace and noted that her wife did not dream. Both remained there to look at the display during twenty minutes without having dared to go nearer to see it more closely, then they returned to bed, because the weather was cold. However, Mrs Roche was quite disturbed and could not sleep. So at 03:30 A.M., he woke up and saw hat the object and its red glow were still there. He went back inside even more worried. On the morning, he saw that there was nothing to see anymore, and that there were no traces on the site. He indicates as source the newspaper "Paris-Presse" for October 2, 1954. 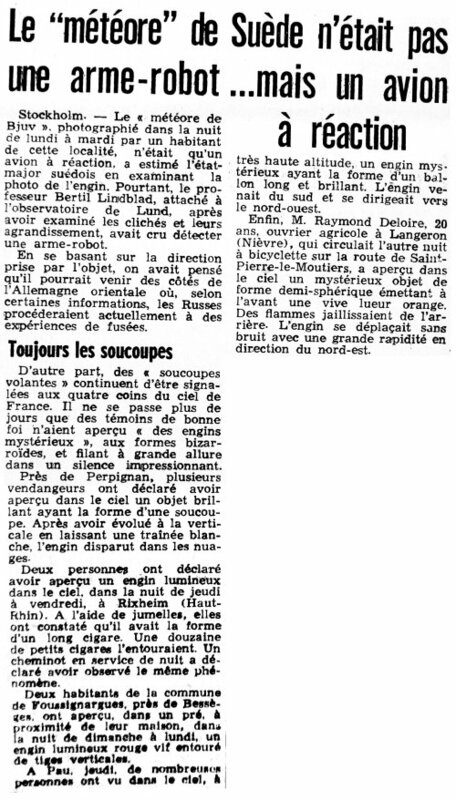 On September 27th, 1954, sightings were made at Perpignan near Foussignorgues [sic], at Lemps, Premanon and Rixheim. Once again these sightings fall on a straight line, the Rixheim sighting was of a stationary cigar-shape, Rixheim lies at one end of the line. Two other sightings of September 27th line up with Rixheim one in Eastern Paris and one at Francles - though not in the same line as the others. Michel Carrouges indicates that the Roche observation was made at a distance of 100 meters and lasted 20 minutes. Jacques Vallée indicates that during the night of September 26-27, about 02:30 a.m., a bus returning from Vals-les-Bains along Route N-130 in the department of Gard, stopped at Foussignargues to drop off Mrs. Julien and her son Andre. They had turned toward their village of Besseges, about half a mile beyond, when they noticed a reddish luminous object in the sky to the east, encircled by a halo of dimmer light, which seemed to be moving toward the ground. Ten minutes later, Mrs. Roche, living at a place called Revety, went out on her terrace for a breath of air, when her eyes were at once caught by the red light coming from a round luminous object apparently on the ground beside the road a hundred yards or so away, and lower down. She later described that "It was rather like a luminous tomato." "Five or six vertical stalks, rather thick, came out of the center of it on top." Mrs. Roche and her husband stood there watching for twenty minutes, not daring to go down and look more closely. As it was cold, they finally left. The object was still there at 03:30. In the morning it had disappeared. Jacques Vallée indicates that on September 27, there was an interesting testimony in Foussignargues. He then says there were cases in the 1954 French flap confirmed by official investigations, with witnesses of obvious good faith and often gifted of a scientif or technical culture, and he says the Foussignargues case is an example. He indicates that at 2:30 a.m. Mrs. Julien and her son André, from Bessège, at Foussignargues, came down the bus that brought them back to Val-les-Bains and went on to Vallières. They walked to their home when they saw a luminous object of reddish color in the sky, surrounded of a paler halo, going down to the East, disappearing behind a hill. It was later learned that the travellers in the bus made a similar observation from a spot several hundred meters in the north-east. Jacques Vallée indicates that on September 27, 1954 in Foussignargues, Mrs. Julien and his André son, from Bessègues, got out of the bus which brought them back from Val des Bains in he Ardeche. The bus set out again towards Gagnières, and Mrs. Julien and her son moved towards their residence in Foussignargues. They then saw a luminous object of reddish color surrounded by a paler halation in the sky, which went down towards the east, and was lost of sight behind a hill. It was learned afterwards that the travelers of the bus had made a similar observation from a point located a few hundreds of meters North-East. Ten minutes after the sighting by Mrs. Julien, her son, and the passengers of a bus towards Foussignargues, Mrs. Roche who lived at the location called Revêti in the hills downwards dominating the road, saw from her terrace a red gleam diffused by a round, luminous object apparently posed on the ground at a hundred meters. "The object made me think of a sort of luminous tomato. Five or six vertical stems, of an appreciable thickness, came out of his center, on its top." The phenomenon was observed by Mrs. and Mr. Roche during twenty minutes. As nothing occurred, they returned inside. Mr. Roche, anxious, stood up at 03:30 in the morning and saw the object at the same place emitting the same red gleam. As fear overcame curiosity, he did not approach the object and returned inside. At twilight all had disappeared and no trace was found. Jacques Vallée indicates that this was told in the French Press of October 2nd and 6th, 1954. The author indicates that on September 27, 1954, in Foussignargues, people in a bus saw the first a reddish object going down from the sky. Later, Mr. and Mrs. Roche noticed an object on the ground, gently luminous, at a small distance from their premises, but they were afraid to approach. The object remained there several hours. It was described as "a kind of brilliant tomato, with antennas at the top." Sep. 27, 1954 0230. Foussignargues (France). At "Revety," people in a bus saw a reddish light coming down. Later Mr. and Mrs. Roche noticed an object on the ground, softly glowing, a short distance from their home, but were afraid to approach it. It remained there for several hours. It was described as "a sort of glowing tomato, with antennae on top." The two ufologists and authors summarize the case in Foussignargues in the department of the Gard on October 2, 1954 at about 02:30 P.M., with their personal file and newspaper clipping as sources. They indicate that a bus with tourists which returned from Vals-les-Bains stopped at the crossroad of Bessèges to deposit there two of the travelers, Mrs. Julien and her elder son. At this time a luminous object of reddish color surrounded by a paler halation appeared in the sky. The object descended while slowing down and became hidden from the sight by a hill. Mrs. Julien, her son and all the passengers of the bus followed its manoeuvers. "One would have said a sort of luminous tomato. Five or six small vertical stems, of an appreciable thickness, came out of its center, above it." Mrs. Roche continued to observe this for some minutes, and as nothing happened, she woke her husband up and the couple both observed the "tomato" during a score of minutes, but without daring to move away from their premises to go to look closer. Since the weather was cold on the terrace, both then returned inside the house and went to bed again. Mr. Roche remained anxious and ill at ease, and at 03:30, he stood up again and returned on the terrace, from where he saw that the object was still there, motionless. Mr. Roche hesitated planning to go to see more closely, but finally prudence won and he went back to bed. In the next morning, he returned on the terrace but there was nothing to see anymore. He went on the location where the object had been but he did not find any trace. The two authors indicate that in Foussignargues in the Gard at the locality "Revety", on September 27, 1954 at 02:30 in the morning, the passengers of a coach saw in the sky a reddish luminous object surrounded of a paler halation which descended while slowing down. It disappeared behind a hill. Behind this hill, Mrs. Roche, not being able to sleep, went on her terrace to take some fresh air. She then saw, landed in a field, an object having the shape of a luminous tomato with five to six kellies leaving its center by the top. She observed this thing during a few minutes, then decided to awake her husband. They both observed the object during a score of minutes, in spite of the cold, then returned to bed. At approximately 03:30, ill at ease and anxious, Louis Roche stood up, went on his terrace, and saw that the thing was still in the field, Mr. Roche went back to bed. In the morning, the object wasn't visible any more. No traces were found by the witness at the place of landing. The sources are said to be the Vallée catalogue case 158; Face aux Extraterrestres by C. Garreau and R. Lavier p.107; "A propos des Soucoupes volantes" by Aimé Michel p. 110; Quincy; Dauphiné Libéré for 1/10/1954; Paris-Presse, Figaro, France-Soir for 2/10/1954. French ufologist Jean-François Gilles had established a computerized catalogue of landings on the French territory between September 26 and October 18, 1954 in order to study if their geographical distribution were the fact of the chance or not. ICOD is an internal code of this listing. (57) refers to column 57 of the Condon group's computerized UFOCAT, where RF is France and the number is the department. JV4 and JV1 are case numbers in Jacque Vallée's Magonia listing and "Passport to Magonia" book. CE2, CE3 refers to the Hynek classification. The Belgian ufologist indicates that in 1954, on September 27, in France, in Foussignarques, "At the locality 'Revety', people in a coach initially saw a reddish light which went down. Later, Mr. and Mrs. Roche saw an object on the ground, which shone slightly not far from their premises, but they were afraid to approach. The object remained several hours there. It was described as 'a kind of tomato luissante surmounted of antennas'." The sources are noted "Paris-Presse, le Figaro, France-soir, 2 Oct. 1954. Anatomy 71", and there is a thanks to Wim van Utrecht. She indicates that another version is: "At 02:30 in Foussignarques (the Gard) people in a bus and the travellers who got out of this bus, Mrs. Julien and her son Andre, suddenly see a sort of yellow and red downward rocket on a white circular background." The source of this is given as "Jimmy GUIEU: "Black-out sur les S.V." - Fleuve Noir 1956 - p. 148 à 149". The Belgian ufologist indicates that in 1954, on September 27, in France, in Bessèges, "At 02:40 the Roche husbands see "a round thing like a red tomato" at 100 m from their premises. This thing had 5 or 6 vertical stems on the top. Mr. Roche said that it was something like a reversed bouquet. At the end of 20 minutes, this thing being still there, the husbands go to bed." The source is noted "Jimmy GUIEU: 'Black-out sur les S.V.' - Fleuve Noir 1956 - p. 148 à 149". 1954 - Foussignargues, France. At "Revety," people on a bus saw a reddish light with a halo come down from the sky at 2:30 a.m.. Later Mr. and Mrs. Louis Roche noticed a softly glowing red object on the ground a short distance from their house, but were afraid to approach it. It remained there for several hours. It was described as "a sort of glowing tomato, with antennae on top." (Sources: Jacques Vallee, Passport to Magonia, p. 212; Michel Figuet and Jean-Louis Ruchon, OVNI: Le premier dossier complet des rencontres rapprochees en France, pp. 89-90). 02:30 Close to Foussignargues, at the locality " Revety ", people in a bus see a reddish object going down from the sky. Later, Mr. and Mrs. Roche notice an object on the ground, gently luminous, at a small distance from on their premises, but they are afraid to approach. The object remains several hours there, with antennas at the top. It is described like a kind of glowing tomato surmounted of antennas. The sources are noted as: Paris-Presse, Le Figaro, France-soir, October 2, 1954; "Vallée, J., Anatomy 71"; and "Vallée, J., case #20, 'Rapport sur l'analyse de 200 observations documentées faites en 1954'"
Luc Chastan indicates in his database that in the Gard (30) in Foussignargues on September 27, 1954 at 02:30 hours, "At the locality 'Revety', the passengers of a coach see in the sky a reddish luminous object surrounded by a paler halation which goes down while slowing down. It disappears behind a hill." "Behind this hill, a woman, unable to sleep, goes on her terrace to take some fresh air. She then sees, posed in a field, an object having the shape of a luminous tomato with five to six small rods coming out of its center by the top. She observes this thing during a few minutes, then decides to awake her husband. They observe the object during some 20 minutes, in spite of the cold, then return to bed. Towards 3:30, ill at ease and anxious, the husband stood up, returned on his terrace. The thing is still posed in the field, he goes back to bed. In the morning, the object is not visible any more. No trace was found by the witness at the place of the landing." The source is indicated as: "Ovni, Premier dossier complet... by Figuet M./ Ruchon J.L. ** éd. Alain Lefeuvre 1979". The website indicates that on 27 September 1954 at 02:30 in Foussignargues, France, "a sort of glowing tomato, with antennae on top" landed. "Explanation: Planet." And: "Foussignargues, France, . At 'Revety,' people on a bus saw a reddish light with a halo come down from the sky at 2:30 a.m.. Later Mr. and Mrs. Louis Roche noticed a softly glowing red object on the ground a short distance from their house, but were afraid to approach it. It remained there for several hours. It was described as 'a sort of glowing tomato, with antennae on top.'" And: "At 'Revety,' people in a bus saw a reddish light coming down. Later Mr. and Mrs. Roche noticed an object on the ground, softly glowing, a short distance from their home, but were afraid to approach it. It remained there for several hours. It was described as 'a sort of glowing tomato, with antennae on top.'" And: "An object was sighted by multiple independent witnesses that had an appearance and aerobatic performance beyond the capability of known earthly aircraft. One red ball was observed by two witnesses, a married couple, on a farm for over 60 minutes (Julien; Roche)." The website indicates that on 27 September 1954 at 02:40 in Besseges, France, "An object was sighted by multiple independent witnesses that had an appearance and aerobatic performance beyond the capability of known earthly aircraft. Explanation: Planet." And: "One object was observed by two witnesses, a married couple, on a farm for several hours." The sources are indicated as Guieu, Jimmy, Flying Saucers Come from Another World, Citadel, New York, 1956; Michel, Aime, Flying Saucers and the Straight-Line Mystery, S. G. Phillips, New York, 1958; Bowen, Charles, The Humanoids: FSR Special Edition No. 1, FSR, London, 1966; Vallee, Jacques, Computerized Catalog (N = 3073); Vallee, Jacques, Challenge to Science: The UFO Enigma, Henry Regnery, Chicago, 1966; Vallee, Jacques, Preliminary Catalog (N = 500), (in JVallee01); Vallee, Jacques, A Century of Landings (N = 923), (in JVallee04), Chicago, 1969; Schoenherr, Luis, Computerized Catalog (N = 3173); Rogerson, Peter, World-Wide Catalog of Type 1 Reports; Hatch, Larry, *U* computer database, Author, Redwood City, 2002. *Sep. 27, 1954 - Foussignargues, France. At "Revety," people on a bus saw a reddish light with a halo come down from the sky at 2:30 a.m.. Later Mr. and Mrs. Louis Roche noticed a softly glowing red object on the ground a short distance from their house, but were afraid to approach it. It remained there for several hours. It was described as "a sort of glowing tomato, with antennae on top." (Sources: Jacques Vallee, Passport to Magonia, p. 212; Michel Figuet & Jean-Louis Ruchon, OVNI: Le premier dossier complet des rencontres rapprochees en France, pp. 89-90). [pr1] Article in the regional newspaper Le Provençal, Marseilles, France, page 11, October 1, 1954. [---] Article in the regional newspaper Le Dauphiné Libéré, France, October 1, 1954. [pr2] Article in the regional newspaper Le Provençal, Marseilles, France, page 4, October 3, 1954. [---] Article in the national newspaper Paris-Presse, Paris, France, October 2, 1954. 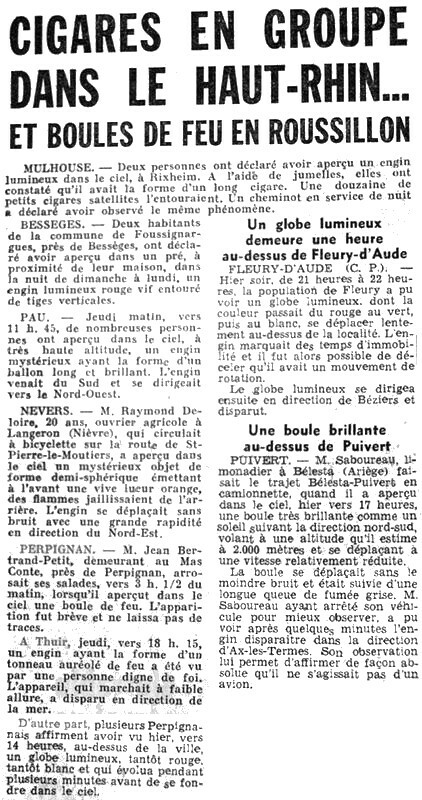 [---] Article in the national newspaper Le Figaro, Paris, France, October 2, 1954. [---] Article in the national newspaper France-Soir, Paris, France, October 2, 1954. [lo1] "Aimé Michel's Orthotenic Lines", article by L. J. Lorenzen, in the ufology bulletin APRO Bulletin, USA, page 6, July 1958. [jv1] "Les phénomènes insolites de l'espace", book by Jacques Vallée, Robert Laffont publisher, France, page 143, 1966. [am1] "A Propos des Soucoupes volantes", book by Aimé Michel, reprint of "Mystérieux Objets Célestes", Planète publishers, France, page 110, 1969. [jv2] Summary by Jacques Vallée in "En Quête Des Humanoïdes", book by Charles Bowen, French translation of "The Humanoids", J'ai Lu publisher, France, pp 37-38, 1974. [jv3] "Un Siècle d'Atterrissages", article by Jacques Vallée in the ufology magazine Lumières Dans la Nuit (LDLN),France, numéro 43. [jv3] "Passport To Magonia - On Ufos, Folklore, and Parallel Worlds", book by Jacques Vallée, Contemporary Books publisher, France, USA, 1969. [jg1] "Black-Out Sur Les Soucoupes Volantes", book by Jimmy Guieu, Omnium Littéraire publisher, France, page 148, 1972. [jv3] "Chronique Des Apparitions Extra-terrestres", French translation of "Passport to Magonia", book by Jacques Vallée, Denoel publisher, France, page 260, 1972. [jv3] "Anatomy of a Phenomenon", book by Jacques Vallee, Tandem publishers, U-K., page 71, 1974. [gl1] "Face Aux Extraterrestres", book by Charles Garreau and Raymond Lavier, Delarge publisher, France, pp 122-123, 1975. [am1] "Mystérieux Objets Célestes", book by Aimé Michel, Seghers publisher, France, page 119, 1977. [jv6] "Les Phénomènes Insolites de l'Espace", book by Jacques and Janine Vallée, Robert Laffont publisher, France, pages 94, 143, 1978. [fr1] "OVNI, Premier Dossier Complet Des Rencontres Rapprochées En France", book by Michel Figuet and Jean Louis Ruchon, Alain Lefeuvre publisher, France, pp 89-90, 1979. [jg1] "L'Isocélie De Fumoux: Un Premier Résultat Scientifique", article by Jean-François Gilles in the ufology magazine Lumières Dans La Nuit (LDLN), France, #209, novembre 1981. 1.0 Patrick Gross February 5, 2010 Conversion from HTML to XHTML Strict. First formal version. Additions [go1], [go2], [jb1], [lc1], [ud1]. 1.3 Patrick Gross March 14, 2010 Addition [mc1]. 1.4 Patrick Gross May 25, 2010 Addition [le1]. 1.5 Patrick Gross June 18, 2010 Addition [jv5]. 1.6 Patrick Gross July 2, 2010 Additions [jv3], [jv6]. 1.7 Patrick Gross October 24, 2011 Addition [in1]. 1.8 Patrick Gross November 15, 2014 Addition [in1]. 1.9 Patrick Gross February 5, 2017 Addition [ub1]. 2.0 Patrick Gross March 23, 2017 Addition [lo1]. This page was last updated on March 23, 2017.